There were a lot of good things to come from the return of Doctor Who to television - new ideas, new actors, new sets, new effects, new stories, new monsters (and new takes on old ones) - but y'know what, I reckon the tagline for the series return takes some beating. Because really, in the long history of people trying to come up with a short sentence to advertise their movie or TV show or whatever, there haven't been many as perfectly suited to the situation as "It's about time." D'you know like we were saying? About the Earth revolving? It's like when you're a kid, the first time they tell you that the world's turning and you just can't quite believe it because everything looks like it's standing still. I can feel it - the turn of the Earth. The ground beneath our feet is spinning at a thousand miles an hour and the entire planet is hurtling around the Sun at sixty-seven thousand miles an hour, and I can feel it. We're falling through space, you and me. Clinging to the skin of this tiny little world, and if we let go... that's who I am. Not counting the various ancillary Doctors (Peter Cushing in the movies, Richard Hurndall standing in for the sadly dead William Hartnell in "The Five Doctors," Rowan Atkinson et al in "The Curse of Fatal Death"), there had been eight previous Doctors by the time Christopher Eccleston was given the job, and each, in collaboration with the writers, had brought their own flavour to the character. Hartnell was old and cantankerous, Troughton impatient and mercurial, Pertwee calm and commanding, Baker entertained by everything, Davison amiable and given to regret, Baker (the other one) a pain in the arse, McCoy secretly powerful, McGann... well, he didn't really have time to be anything much, although he did properly snog his companion, which was new. Eccleston, facing a fairly mammoth task in reinterpreting the Doctor for his big comeback, merged several of the most successful qualities into his Doctor - gleeful like a child, wise and careworn as a parent, gentle and angry in equal measure. It's a real shame he only stayed around for one season, he was bloody brilliant. 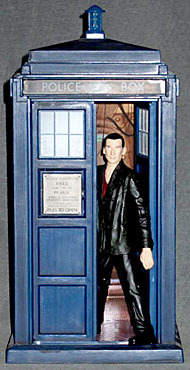 This figure is the second Ninth Doctor - the first was largely pre-posed, but this one shows the direction Character Options swiftly started moving in as they settled into their role of turning a profit from putting Doctor Who onto toy shelves. 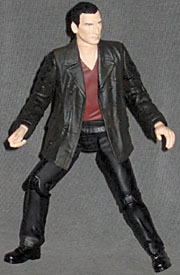 From the neck down, he's sculpturally identical to the "regeneration" Tenth Doctor from the aforementioned gift set (since, in fact, that figure was a re-use of this one) depicting Eccleston's habitual casual attire of t-shirt, black pants, and a well-worn leather jacket. As with the regeneration figure, with no pre-set pose the jacket looks a bit limp hanging on Eccleston's gangly frame, but the t-shirt - now burgundy rather than black - adds a bit of visual interest, and articulation offers various options for vitalising the figure. The face is the same sculpt as the previous Eccleston figure, so again they've nailed him - Character Options really need to hang onto whoever's doing their sculpting, because the range of quality likenesses they've produced over the whole Doctor Who range is second to none in the toy market. The paintwork is largely the same as the previous figure too, but the different body changes the appearance a bit - now that the head is on straight, rather than leaning forwards slightly in the preset pose, he appears to be looking slightly upwards, which gives him a more surprised, childlike quality than before. 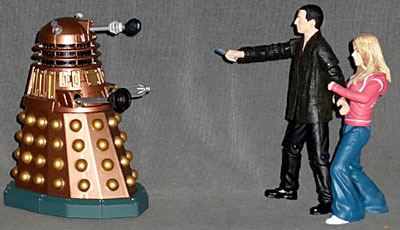 Articulation is up to the standard most Doctor Who figures nowadays inhabit, with the exception of the neck, which is just a swivel rather than the balljoint the luckier figures in the range get. Otherwise he has swivel shoulders and biceps, pin elbows, peg wrists, a swivel waist, swivel/pin hips, and hinge knees. The lack of ankle joints makes balancing a bit difficult, but all things considered he's a pretty stable figure, and can cope pretty well with having one foot angled to the ground. The only area Character Options regularly drops the ball in is accessories - some figures get them, some don't, many omit them when they're repackaged, and so on. This Doctor - there's no easy way of saying it - is missing his sonic screwdriver. His right hand is obviously sculpted to hold it; fortunately the articulation means he can be posed in such a way that its absence isn't too obvious. The lack of screwdriver is an annoyance, no two ways about it - but in every other respect, this is a perfectly good action figure in the Doctor Who range, which puts it quite a way above most other lines. Even if you're not collecting all the Doctor Who figures - or all the Doctors, which with the classic series figures now on the way may become possible - Eccleston is a pretty major figure in the new series, and shouldn't be absent from any collection. This figure will fill that role just fine.